Rogue Male was written by Geoffrey Household and published in 1939. It is one of the first assassination novels told from the point of view of the assassin. Widely regarded as a classic, it is often mentioned in lists of the top ten spy novels of all time, although really more of a chase thriller. Warning: Major spoilers are blacked out like this [blackout]secret[/blackout]. To view them, just select/highlight them. After failing in an attempt to assassinate Hitler, an upper-class English hunter is tortured and left for dead, but escapes back to England where he tries to ‘go to ground’ in the countryside. The enemy catch up with him and he has to use all his hunting skills to survive. Rogue Male opens with an unnamed upper-class English big-game hunter being tortured by the secret police of a European country (probably Nazi Germany although possibly the Soviet Union). The Englishman has just been caught near their leader’s villa, seemingly about to shoot. He claims the ‘hunt’ was just a sporting challenge and he was not really going to kill the dictator. The secret police do not believe him but unable to get any other information from him, they decide to fake his death by throwing him over a cliff and leaving him for dead. By pure luck, the Englishman lands in a bog and is not killed. Although severely injured, he manages to crawl away and hide in a tree after making it look like he fell into the river and was drowned. The secret police are fooled. The Englishman sails down river until he reaches a port, where he stows away on a British ship and makes good his escape. In London, the Englishman contacts his solicitor to arrange his affairs. He thinks the British state will not protect him, and is reluctant to involve his friends, so he resolves to lie low until the heat is off. Spotted leaving the solicitor’s office by enemy agents, he is chased into a London Underground station. There, he kills one of his pursuers by throwing him onto an electrified rail. He then gets equipment together in order to ‘go to ground’ until the search dies down. He buys a bicycle and sidecar from a holidaying family and travels to the Dorset countryside, where he builds an underground hide in a sunken lane that is overgrown and almost invisible. The first part of the book ends with the hide set up and the Englishman, who has adopted a feral cat, believing he just has to stay out of sight until the enemy give up. I thought this came out quite well. It’s a masculine and somewhat old-fashioned thriller cover, which suits the story. The bold font with its hints of targets and blood drops worked for the story of an assassin too. 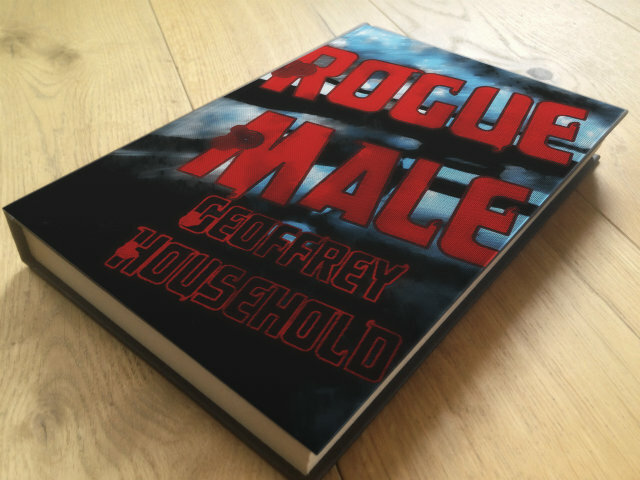 Rogue Male is not actually what most potential readers would expect. 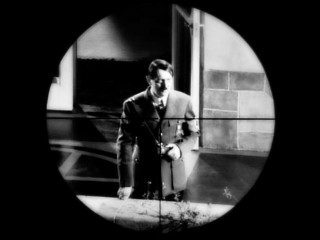 It is not about the assassination in the way The Day of the Jackal is about the attempted assassination of Charles De Gaulle. The assassination attempt is before the start of the novel, and the actual ‘hunt’ is only described briefly. Instead Rogue Male has an On The Run plot, in particular a subtype I call the Straight Run (see Spy Novel Plots). Is involved in an Inciting Incident with a group of Antagonists. Realises they are not safe from the Antagonists. Is also not safe from the authorities, as they are tricked or controlled by the Antagonists. Goes on the run, pursued by both the Antagonists and the authorities. Involves one or more Allies in their escape (Optionally, there is a romance sub-plot with one of the Allies). Narrowly avoids capture and death (or is captured and escapes) by both the Antagonists and the authorities. Persuades the authorities they should work together to stop the Antagonists. Confronts the Antagonists and stops (or fails to stop) them. The plot and the writing in Rogue Male are tight and the minutiae of surviving off the land when you are a fugitive, are well described. Rogue Male has a great central character, the upper-class ‘Englishman’, whose paranoia and mental deterioration as he is hunted are palpable. His dawning realisation that his motivation was not just sport but revenge creates some nice character development. I want these papers published. If necessary have them brushed up by some competent hack. Is the ‘Great Man’ Hitler? Rogue Male was written just before World War Two, at a time of international tension. The dictator is named, ironically, as ‘The Great Man’. It is usually assumed that he is Hitler, but he is not specifically stated to be and there is another possibility – Stalin. The ‘Great Man’ is described as wearing a waistcoat – something neither man was known for. The Englishman’s escape route takes him over the border and into Poland, which could of course point to either Germany or the Soviet Union. In a passage late on in the book, Quive-Smith talks about why he hates Britain, giving a socialist-sounding critique of imperialism. The Englishman says he sounds like the ‘other dictator’. This is the least ambiguous pointer to Hitler. Let the public take its choice! The public did take its choice and decided the Englishman’s target was Hitler. A fascinating tale with a great high concept idea, but be aware that it’s a ‘man on the run’ thriller, not an assassin-procedural. Rogue Male was filmed as Man Hunt in 1941, directed by Fritz Lang and starring Walter Pidgeon and George Sanders. The plot is largely faithful to the novel, although the Englishman is helped by, and falls in love with, a woman who helps him during his escape. The end is very similar to the novel. There was also a BBC TV production in 1976, starring Peter O’Toole, John Standing and Alastair Sim. Again the movie is faithful to the plot of the book. Nearly fifty years after he wrote Rogue Male, and at the age of 82, Geoffrey Household released a sequel called Rogue Justice. The Englishman, who ended Rogue Male claiming he was returning to finish the job, fails again and again is captured. He then escapes and fights his way across war-torn Europe to the Middle East. In Rogue Justice, there is no ambiguity, the dictator the Englishman is obsessed with killing is definitely Hitler. Rogue Male is available on US Amazon here, and UK Amazon here. If you’d like to discuss anything in my Rogue Male review, please email me. Otherwise, please feel free to share it using the buttons below. A Kill in the Morning – Publication Day!